I decided that for one of my "away" posts I'd join the game as invited by Jo at Poetic Shutterbug, Ann at Ann's Snap and Scrap and Ratty at Everyday Adventurer. You are supposed to look in your 8th picture file, and choose the 8th picture. Then talk about it, and pass the game on to 8 other people. I chose to open the 8th picture file that is on my desktop at the moment. I wish that the picture were something more interesting, but at least it's not some blurry mess! This is from the 2009 North Country Trail Association annual conference in North Dakota, last August. This was the dinner held the first evening, and the program was awards given by the National Park Service to volunteers who have given a great deal of time to the NCTA. The room is filled with long-time friends, and some people I am just getting to know. 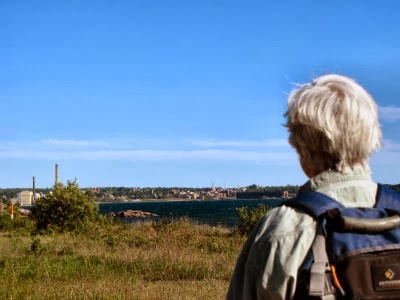 For example, in the extreme foreground, the couple- he's in a blue t-shirt and she is wearing a pastel plaid shirt- have become more than just trail friends. Marie and I have spent time at their lovely cabin on Skunk Lake in Minnesota. They introduced us to our favorite game, Quiddler. 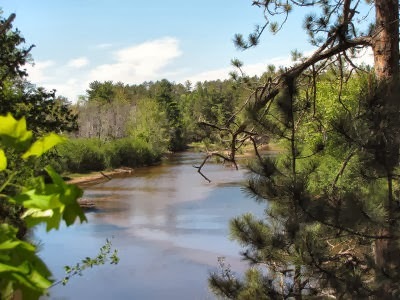 They are leaders in the Itasca-Moraine Chapter that has built miles and miles of new trail where we had to bushwhack many years ago through the Paul Bunyan State Forest. Next to them, the man in the brown t-shirt and olive baseball cap is a very quiet guy from the same chapter who met us on that hike so long ago and led from the end of the trail in the Chippewa National Forest to the next section. Behind him is a couple whose faces are mostly hidden (these sorts of "banquet shots" are pretty useless), is another Minnesota couple who also worked hard on that new trail, and invited people to their home last summer. Remember the eagle nest? It was just outside their garage. The woman about in the center of the picture, with a salmon-colored blouse, is the new president of the Hiawatha Shore-to-Shore Chapter, just north of the Mackinac Bridge. I know she's had a busy year! So that's what's good and bad about pictures like this. They are just a bunch of people, and you probably don't know any of them. But for those of us who are involved there are lots of good memories associated with the backs and faces of those whom we recognize. I'm also just going to invite anyone to play. It's such a fun game, why not try it! Today was one of our challenge days, but first let me tell you about the picture above. 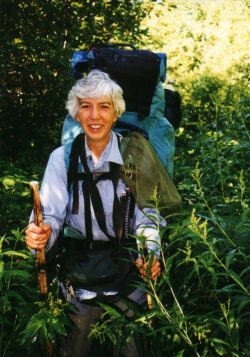 While in Marquette we are staying with a trail friend named Lorana. She has let us stay at her house and helped us find the trailheads and given us lots and lots of information about the local trail. Today was our last day of day hiking, and tomorrow we put on the full backpacks. So this morning Lorana drove out to the trailhead with us and hiked with us for about an hour, then drove Marie's car back to Marquette. As you can see, everyone is in full mosquito gear! The river beside them is the Little Garlic River which we more or less followed almost all day. We followed lovely trail for the first three miles, then the rest of the day was more or less a bushwhack. It began with following a bunch of sand roads, none of which were marked. However, Lorana's NCT Chapter has the way GPSed, and she is letting us borrow her unit for the rest of this hike. So we just needed to check at any junctions we weren't sure about, since the roads are on the base maps. (If you are curious about which GPS we had, it's pretty much the same as this one that I borrowed two years ago, the Garmin 76Cx) This was the most interesting feature of the road walking- a bridge over a stream made from an old railroad flat car! While we were still on the road we came upon this interesting scene. Try not to be grossed out. The flies and the butterflies were attracted to this dung pile. The butterflies like the moisture. These are Tiger Swallowtails. We found the end of the blue line without much trouble and ranged back and forth across it, but couldn't find any blazes at all. We were working our way through thick forest with lots of hemlock (nasty to push through) with a very steep incline down to the Little Garlic River. At one point we managed to swing a bit too far north and got over on the next ridge, so we had to cut back across a gully to get back on the blue line. You can see me here studying the GPS, no trail in sight! While we were working our way back we came across a very old logging road that was going the correct direction. We took it, with a cliff on our left. I said, "I think whoever scouted this line was up on that cliff." Pretty soon the cliff came down and there was a break to the left. We ranged over that way to cross the blue line in a wide enough swing to take in the margin of error for a handheld GPS, and sure enough we found some blue blazes. At that point there still wasn't really a treadway. The crew had been working from the other direction, and this was really close to the farthest point they had reached, where only minimal clearing, and some blaze painting had been done. Nevertheless, this was lots easier than total bushwhacking. The farther we went the better the trail got, with nice benching and rock work. We reached the car at 2:30, with the temperature at 86 degrees. We were not sad to go find a cold drink! We came back to Lorana's and cleaned up, then re-organized the gear into the full backpacks. After that we put one car out at the place where we will end Tuesday night, and ate out on the way "home." Tomorrow is all road walking (dirt roads), then the next day is some possibly serious bushwhacking (with the GPS), and on Tuesday we'll be in the McCormick Wilderness, again with GPS help. It's really like shooting fish in a barrel with technology, but I have to admit that I did not turn down Lorana's offer to borrow hers! See you Tuesday night with more "live action!" But I do have a post scheduled for every day in between. Today was sure to be one of the most memorable from this trip. The Lake Superior shore is amazing, and the area around Marquette has a lot of very interesting rock formations. For most of the morning we were alternating between trail that went over and around rocks like this, and soft trail cushioned with hemlock and balsam needles. See the blue blaze painted on the rock right at the bottom of the picture? When we got on top of another set of rocks we could look back and see Hogback Mountain. The trail had not gone directly over the top, but had run along its shoulder. When we dropped back down to the shoreline of Lake Superior... well, this is just my favorite kind of beach. Look at all the rocks! The sun was warm and the air cool- my favorite kind of weather. Blue water, blue sky, red and black rocks, nice trail... even a few thousand mosquitoes and a pet deerfly or two couldn't dampen the joy of the day. The longest point in the last picture is actually the end of Little Presque Isle island. We ate lunch with a view of the whole island. About 23 miles for this hike so far. Today was our first day of hiking, and it was awesome! 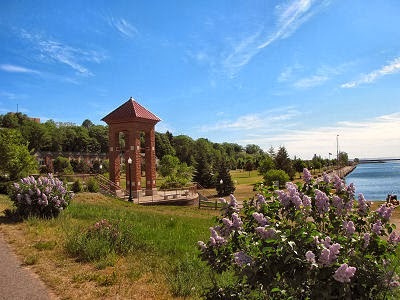 We started on the south side of Marquette, and most of the day was urban trail through town, right along Lake Superior. This was our view from the Welcome Center as we left this morning. After the really hot days of the early part of the week, 75 degrees and a stiff, cool breeze off the lake felt delightfully chilly. It was really a wonderful piece of urban trail. Marie and I enjoy the "house tour," and all the flower gardens as well. 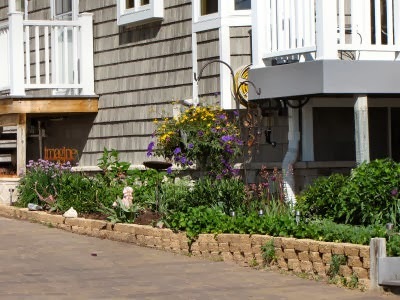 This was just a typical small garden, but multiplied house after house after house added up to lots of pretty plants. 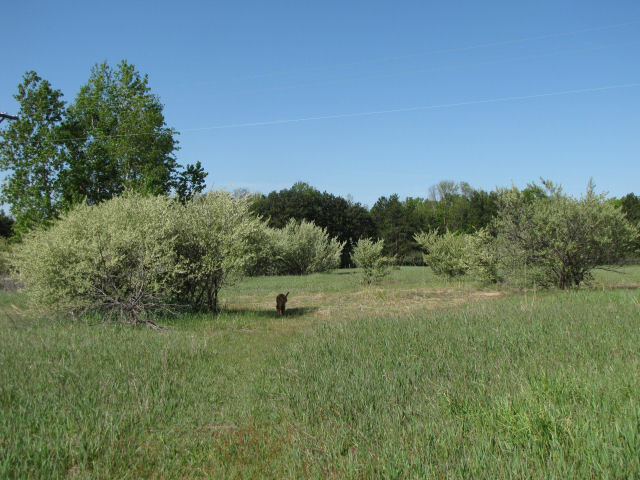 Here is one of the park spaces to be found along the trail. The bell tower is a memorial for Sept 11. I had to discipline myself to not post a huge pile of pictures, but tried to give you a feel for the day. When we left the urban area, we hiked the rest of the day along the Dead River, which as you can see, is not dead at all! 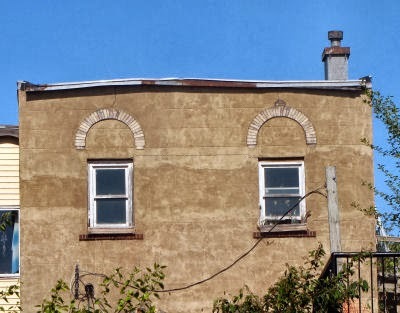 Finally, we just thought this house expressed a nice sentiment for the day with its silly grin. We are out the door! Two little green Subarus loaded, but not to the gills, just nicely. Thanks for all the support and enthusiasm. I'm sure I'll be able to post for a few days, and then I have some stuff scheduled. Happy Memorial Day and June, everyone! I was inspired by John's Sphinx Rock over at English Wilderness. Sometimes there are so many overwhelming things to see on hikes that I never get around to sharing some of them. Here's an example. This great monolith is known as Magnetic Rock, and it is on the Border Route/ North Country Trail in Minnesota's Arrowhead. This is one instance where the Ham Lake fire of 2008 might be considered to provide a benefit. Previously, this rock was quite hidden among the tall trees of the forest. Now... well, you can see how it looks now! We were there just about a year ago, so I suppose I should qualify the "now," but no tall trees have grown up in a year. Need some perspective on how big Magnetic Rock is? Try this. We leave tomorrow morning! I'll try to post just before we go, and I've got some things scheduled, too. See Live Post- What a Hike! Just a quick report on the baby white pines. All the conifers are showing their lovely new growth right now, but this is the year that I think the white pines are really going to shoot up. See how long those "candles" of new needles are? Those will extend and grow into bundles of the regular dark green needles. 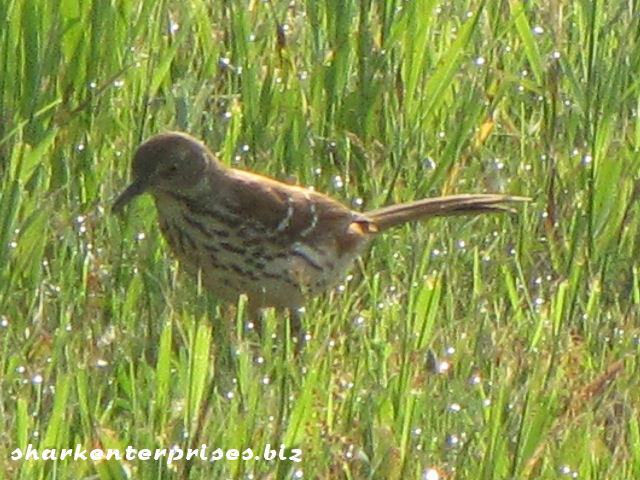 Brown Thrashers have always been one of my favorite birds. I can't even quite explain why. I think it's partly because they are somewhat secretive, usually flitting around in the understory. Probably, partly because it's a bird I learned as a child. Their brown is a rich chestnut, one of my favorite hues. 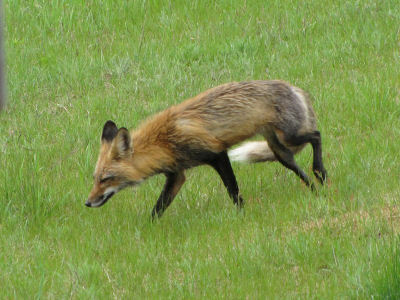 Early this morning, look who was hunting for bugs in my lawn! Not one, but a pair of them! I wasn't sure I could get their pictures, and indeed, they flew up into an apple tree. But then they came back down to finish their breakfast. I was shooting into the morning sun, so the pictures could be better, but I'm thrilled to even get these. Note the rather distinctive shape. They are about the size of a robin, but the tail is longer, and so is the beak. 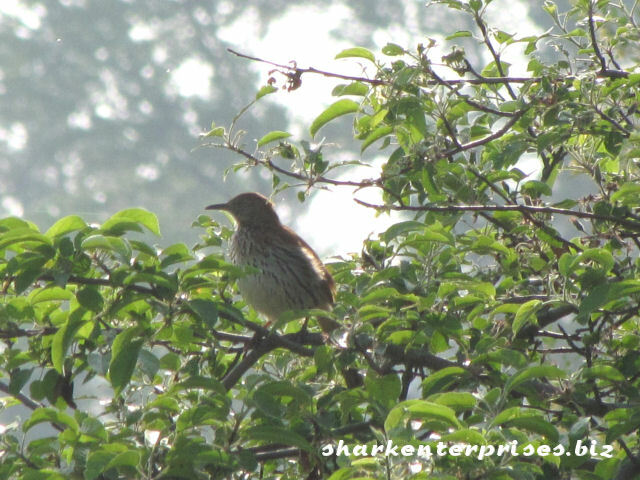 Some people mistake them for the Wood Thrush. 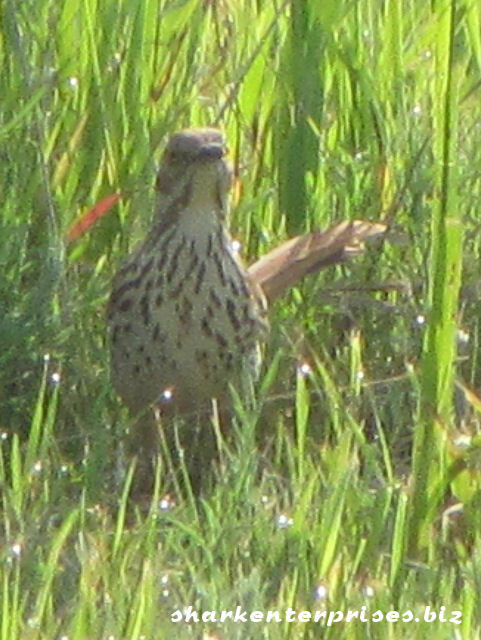 But the thrush has a spotted breast, while the Brown Thrasher's is streaked. No, I'm not going to quote a poem by Shakespeare. I'm not referring to a play by Edward Albee. I'm not even going to talk about our friend Chuck's wife. 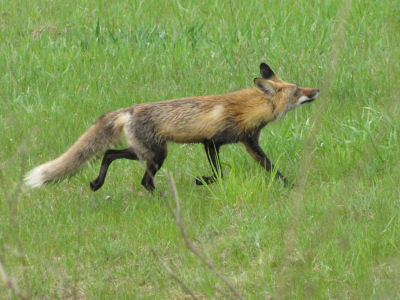 Do you remember the fox I saw a few weeks ago that trotted across the field? Well, before I left on the last hike, it wandered right across the back yard! I pulled the SD card out of the computer, ran for the camera and the door. Of course that got Maggie barking, and the fox was long gone before I got there. Two days later... there it was again! Same MO as above, I quick tried to snap a shot through the deck door. You can see how that turned out. So I figured that was the end of that. But I went out the front door quietly and eased around the corner of the house. Here's what I saw. Pretty awesome, eh? Of course she immediately realized that I was watching her. We stood there looking at each other for several minutes. She seemed more cautious than afraid. Finally, almost casually, she turned and left the yard, using one of my trails. She had to have a name! So I chose Sylvia, "of the woods." And I even know what lured her into the yard. 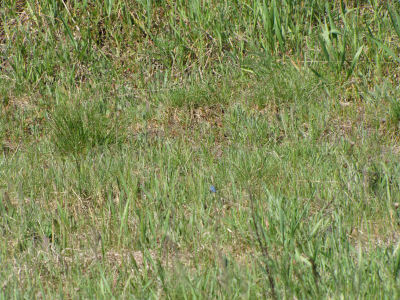 She was nosing around one of the holes to the burrow of those little 13-lined ground squirrels. I think she probably has kits somewhere and was hunting hard to bring home a meal. She didn't catch one right then, but as cute as the little squirrels are, they are making swiss cheese of my lawn, and a few less would not be a problem! 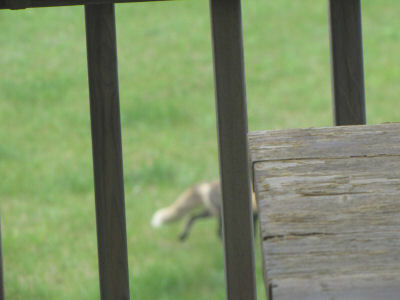 I actually feel honored to have a fox right in my yard, and to have looked her in the face. Hope you enjoy her, too! 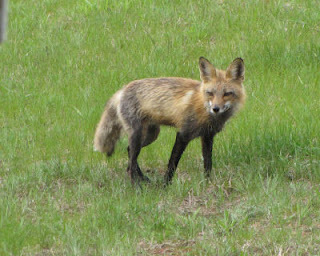 See Dandelion Syrup and a Great Surprise for my first encounter with this fox. 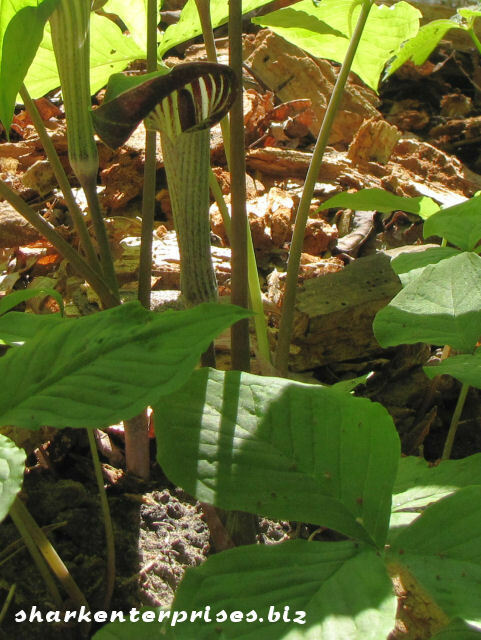 Many of you from the Northeast U.S. will recognize this familiar, and yet exotic-looking plant. 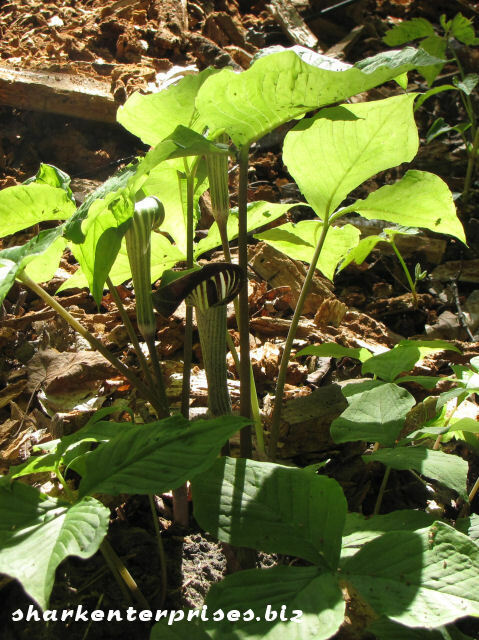 This is the Jack-in-the-pulpit Arisaema triphyllym, a springtime favorite. 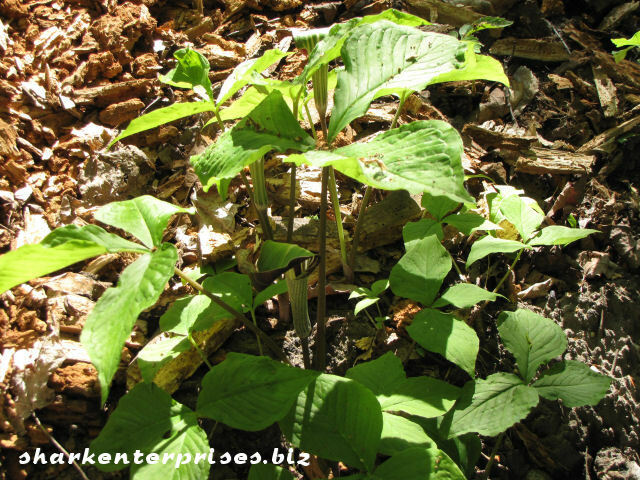 It likes to grow in rich, moist woods. Lots of people share pictures of this, but I really like how the light was shining on the leaves yesterday (it's raining today). I'm even happier to tell you that these are growing in my "kingdom." They are down near the creek in the cemetery, and I first found them last year. I'm hoping that this small patch spreads. They have relatives around the world... many in Asia. The genus is often called Cobra Lilies. It gets it's common name from the resemblance of the flower to a preacher standing in an old-fashioned tall pulpit. That flower shape is called a spadix. Does it remind you of another plant? Take a closer look. Isn't it beautiful! Yes, plants like the peace lily and Anthurium are related, all having a spadix. But don't forget another wild one, the Skunk Cabbage, Symplocarpus foetidus. I've linked below to a post which talks about that very early plant. I didn't manage to catch some of the behavior I observed for these little Chipping Sparrows, Spizella passerina. It looks as if they are wiping their beaks on this branch. That may be just what they are doing. What do you think they ate that made them want to clean up? 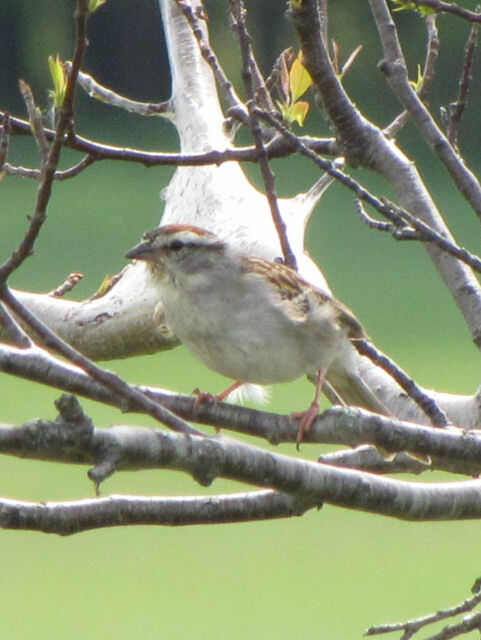 They are some of my favorite sparrows. They are small, and very common, but endearing. I love their bright chestnut heads. More tame than many birds, they will hang around under windows, on sidewalks, etc. tilting their heads as if listening when you talk to them. Ah! 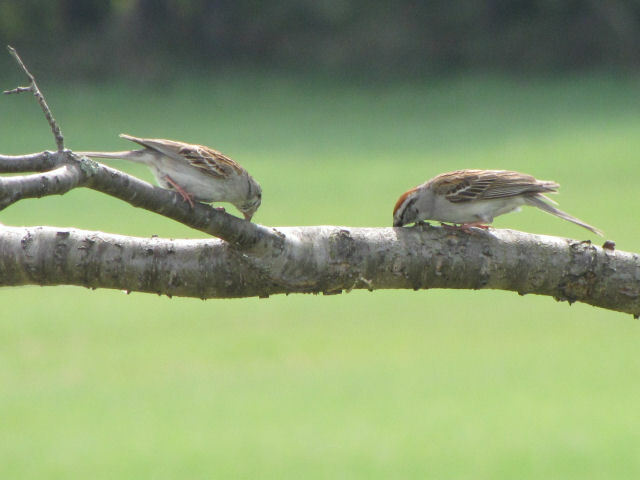 Now perhaps you can guess what these sparrows were enjoying. See the white "net" behind them? That is a tent caterpillar nest. Even though I didn't get a picture, I can guarantee that there are at least two fewer caterpillars than there were a few minutes previous. Going outside is always a good way to chase away the blues, but that's not what I have in mind here. Can you find the little blue spot? This should help. Or not. Looks like a tiny, tiny blue bird, doesn't it? 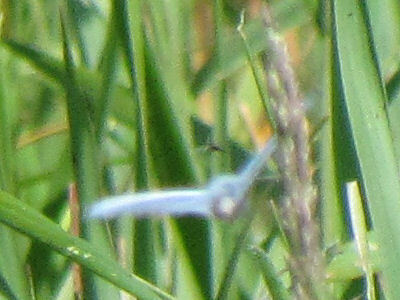 Well, sort of... it's a little blue butterfly. 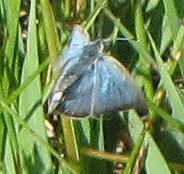 I'm pretty sure that it's a Spring Azure Blue, Celastrina ladon, or in older books, Lycaenopsis argiolus. 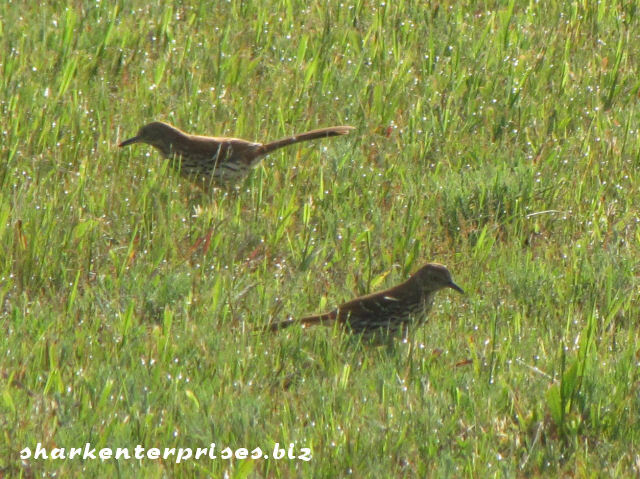 They are flitting all over the field and lawn. They are probably drunk with the honeysuckle and autumn olive nectar, since they aren't fussy nectar feeders. But I sure couldn't get a good picture. They just don't hold still long, and if they do perch they close their wings and practically disappear since the undersides of most "blues" are dull gray to brown. 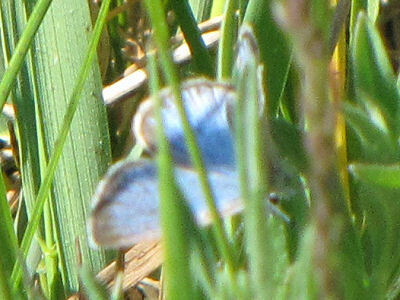 They are only about an inch across with wings extended. There is a big push locally to plant more wild lupine, since it is a required food plant for the endangered Karner Blue butterfly, Lycaeides melissa samuelis. Since I don't have any lupine (I've tried twice to get some started here... seems like it would be perfectly happy), I didn't have any delusions that this would be the elusive Karner. It's easy to tell that it is not, since the Karner has a row of iridescent orange spots on the hindwings. None of these pictures is really good. Maybe I'll get luckier another time. But I wanted to show something other than plants today. Finally, here is my favorite, even though the focus isn't crisp. At this time of year there are a couple of terrible invasive plants in full bloom. 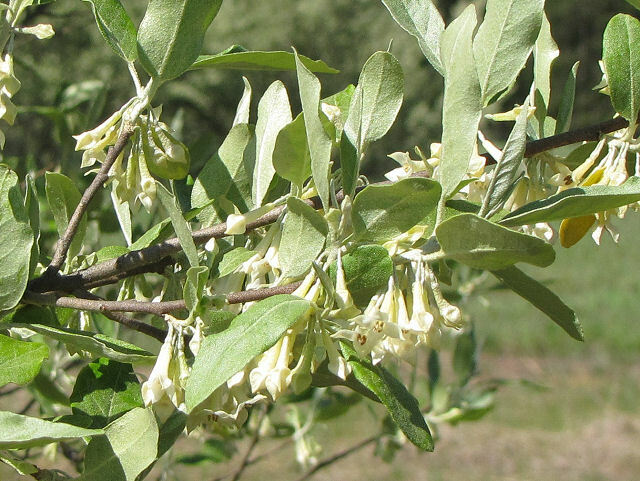 The one I'm showing today is Autumn Olive, native to Eurasia. 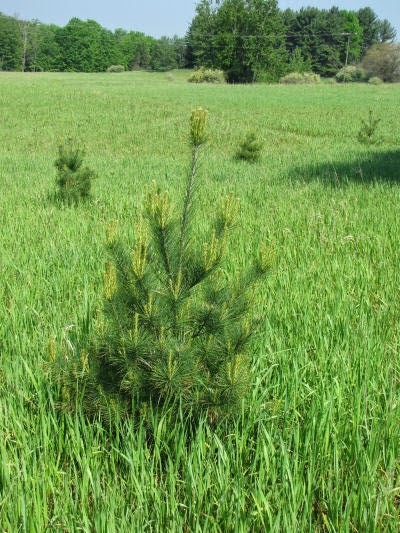 It was planted in many areas of the United States as a windbreak. Here in the sandy soil of west Michigan it has been wildly successful. It can fix nitrogen (use it from the air) the way legumes can. This means that it can grow easily in poor soil. We have lots of that! The flowers cover the entire bush, and the smell is so sweet it is overpowering all through my field this week. It's cloying and honey-ish. These flowers become small berries which birds love, and thus they spread the plant even more. The worst of it is that the berries have low nutritional value for our birds. Yes, it's a beautiful bush, but terrible. It will kill any other plants around it. All the ground beneath the large shrubs becomes barren. If you cut it down it will sprout 5 new stalks for every one. The only thing you can do is cut it off then immediately spray the stump with Roundup. I've done a lot of that near the house, but it would be a huge job to clear the field. 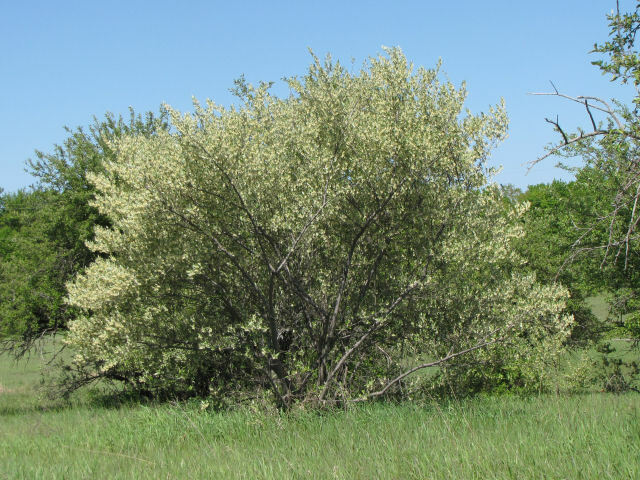 It also has thorns which irritate when they prick leaving a welt for several days. I don't like gloves, but I always wear them when clearing this nasty baby. Winner! - Edited and Changed!